Public education advocates such as Education Week writer Anthony Cody have noted that NBC’s nationally live broadcast program, “Education Nation,” too often has excluded voices of educators and critics of the corporate education reform agenda. When I got the call to participate, I was surprised and unsure if my voice would truly be heard. I spoke with other Garfield High School educators about the opportunity, and they counseled that if time was provided to describe the collective action we took in boycotting the MAP test last year, then it would be worth it. Thankfully, I was given the opportunity to describe the actions of my colleagues at Garfield on the program. There will be a link on the MSNBC website to that description sometime next week. For now they have posted a link of my response to NBC nightly news host, Brian Williams, question “You’re not against testing are you?”, I responded in this way on the “Teacher Town Hall” panel. Education Week wrote of Josh Starr, Randi Weingarten, and my contribution to Education Nation as a “Clash in NYC” with testing advocates. 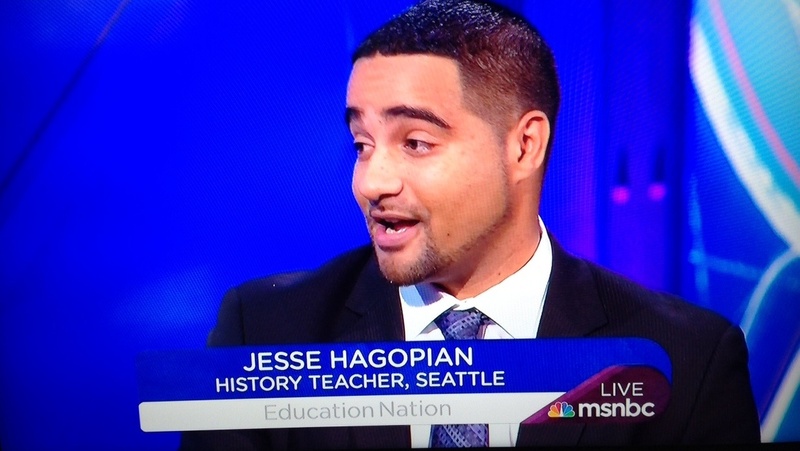 “The fourth annual Education Nation Summit is underway in New York, and one of the stars of the show is NEA member and high school teacher Jesse Hagopian. The theme for this year’s summit is “What it Takes” for the nation to ensure students are successfully prepared for college, career and beyond, and Hagopian emphatically argued that what it takes is an end to “drill and kill” testing. All in all, I was very happy to be able to help inject a serious debate on a national level about the corrosive nature of standardized testing on public education and the many important alternative ways to assess student leaning that promote the kind of critical thinking education our nation so desperately needs.